One of my favourite autumnal activities every year is the search for and purchase of a new winter coat, and if you’re on any level as indecisive as me, you’ll know how gruelling and long process this can be. For me, this process entails weeks of comparing a handful of coats on the grounds of price (obviously), colour (what will it go with in my wardrobe? ), shape (will I look like a snowman/detective/etc. ), trend and general cosiness (will it see me through the cold months? - AKA all year in England). 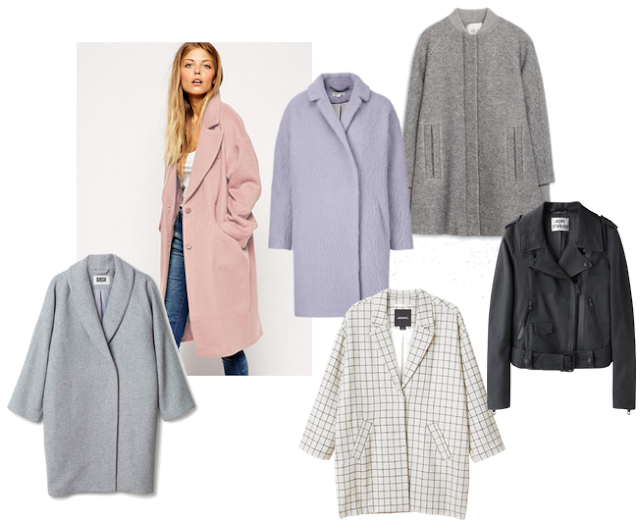 So this week I’m guiding you through my process of choosing an A/W coat. This year, all of my potential coat picks are of a similar oversized cocoon shape - I’m all for looking clean cut and neat as this 60s shape generally does. The typical length of these coats ranges from the knee to mid thigh, which is great for making you look taller (a trait little ones like me will never refuse) as well as keeping a good third of your body super snug. I’ve always been scared of longer coats as I was worried I’d give off a Sherlock Holmes vibe (or look like I was sporting a crazy thick dressing gown) but after years of coats cutting me off at the waistline - thus leaving me with a bit of a frosty bum and disproportionately wide hips, I’ve taken the plunge and invested in a chic and sophisticated winter warmer - if I do say so myself. I’ve found that with a little boost from a pair of heeled ankle boots (to make sure those legs don’t get forgotten about underneath all the cosy) and cat eye sunglasses, the very thought of Sherlock Holmes is banished just as quickly as it entered my mind. Aside from this gorgeous Acne matte leather jacket (because, well, who can say no to Acne?) note that there is no black in my picks. I’ve included a leather because I think they’re essential for the lead up to winter when the weather is being classically September and won’t make up its mind). Black is usually a go to colour when it comes to year round (and especially winter) dressing, but these coats are an attempt on my part to inject a little colour into my wardrobe through these pastels and greys that will hopefully encourage me to cheer up my typically moody outfits. I would usually advise you to stick to solid colour when buying a coat as it has to go with everything you own, patterns included, but I couldn’t not share this gridded Monki oversized blazer with you. Me, the self confessed grid obsessive that I am, almost burst with excitement at the thought of this jacket and would be willing to throw out every piece of patterned clothing I own if it meant owning it. Alas, during the comparison, the warm-factor (or lack of) prevented me from snapping it up and led me into biting the bullet early this year and buying this dusty pink ASOS number (there was only 1 left in stock, and nothing strikes as much fear into my heart as those dangerous words). To get as much wear out of my coat as possible, I’ve been wearing it daily over bare legs and crop tops so as not to bake alive (it’s been pretty warm). I often find myself in this predicament but I just can’t bring myself to buy an item and watch it sit in my wardrobe for two months before it actually needs to be worn. Fingers crossed it actually cools down soon so I can test it for real. Do any of you share my yearly struggle of coat-choosing? How do you go about the task?